Is Trump’s Pick for Homeland Security a Trojan Horse? Observers fearful of the Trump administration’s intentions in the array of important issues (like immigration and terrorism) in the purview of the U.S. Department of Homeland Security were probably relieved when word came down the next secretary of DHS would be retired Marine General John Kelly. Yes, Kelly is often described as a “border hawk,” and he also pleased conservatives by resisting the closing of the Guantanamo Bay interrogation facility. But he was also a top military aide to two Obama defense secretaries, and had indicated he was open to service in either a Trump or Clinton administration. Perhaps most important, Kelly is not Kris Kobach, the fiery crusader against immigration “amnesty,” alleged voter fraud, and nefarious Muslim plots to rob Americans of their priceless heritage of freedom. The name of the Kansas secretary of State, who is a big-time national celebrity among hard-core conservatives, had often been mentioned in connection with the DHS gig. 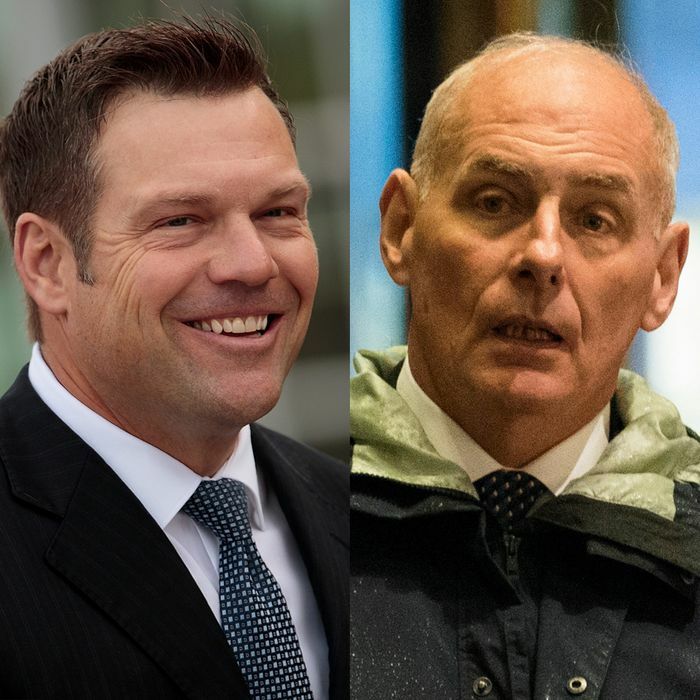 Kansas Secretary of State Kris Kobach and retired Marine Gen. John Kelly are likely to be tapped for secretary and deputy secretary of homeland security, according to a top transition official familiar with the president-elect’s current thinking, but the source would not reveal which of the two men is favored for the top post and which is likely to be deputy secretary. If that is correct, it is entirely possible Team Trump decided to make the less controversial Kelly — who faces a much easier Senate confirmation — the figurehead at the top of DHS, while installing Kobach as his deputy with special responsibilities for immigration and anti-terrorism policy. And there is also the option of placing Kobach at the Justice Department with authority over enforcement of immigration and voting laws. Crediting the upcoming administration with a “moderate” cabinet appointment might be accurate but also misleading.